Rennick and Max Williams get ready to plunge into more powder at Park City (David O. Williams photo). Here’s a fun thing to do if you have the time and don’t mind driving through a massive snowstorm: Powder ski your way from Steamboat to Park City to Vail. That’s what we did over the weekend and into the first part of the week, and our timing couldn’t have been better. We started on Saturday with a high school Nordic ski race in Steamboat Springs, where it was warm and very snowy. Our oldest son Nick fought his way through serious wax challenges and qualified for the state championships later this month in Aspen. 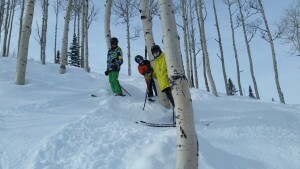 The Williams boys in the aspens beneath Dreamcatcher at Park City (David O. Williams photo). Then we threw his skis on top of the car with the alpine gear and headed west on U.S. 40 into a blinding blizzard. That lasted until Vernal, Utah, where conditions eased up a bit until Heber City, where the snow started rocking again. Sunday was a nice “little” 7-inch powder day on top of 5 the day before. It was my first look at the $50 million injection of capital Vail Resorts pumped into Park City in the off-season after its $182 million acquisition, linking its Canyons resort with Park City via the new Quicksilver Gondola and building a very nice new on-mountain restaurant called Miners Camp. Sunday night we took in the grand jury prize winner for a narrative film and the audience choice for best movie at the Sundance Film Festival, a timely slave-revolt picture called “The Birth of a Nation.” More on that later in a separate blog. As we stood in line at the Eccles Theater it started to snow, and when we came out after the film it was absolutely pounding. It was coming down even harder after an incredible dinner at the iconic Grub Steak restaurant (thanks again, Hans), and so we headed back to The Yarrow DoubleTree by Hilton with visions of powder dancing through our heads. 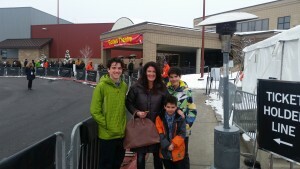 Catching a film at the Sundance Film Festival in Park City, Utah (David O. Williams photo). The next morning did not disappoint. Park City received another nine inches on top of the foot new that fell Friday and Saturday. We parked over at what used to just be called the Canyons but is now Canyons Village, took the old cabriolet to the Red Pine Gondola and soon found ourselves in knee-deep powder under the Saddleback Express chairlift. From there we tried to make our way over to the Ninety-Nine 90 Express, which accesses some of the steepest and best tree skiing at the Canyons, but it was closed all morning for avy control, which was fine since it was so uncrowded on a Monday that it didn’t matter where you skied. We found freshies galore everywhere we went, including the stellar aspens beneath the Dreamcatcher lift, which was all expansion terrain when I first skied the Canyons 10 years ago. Ironically, that was when the Canyons was still owned by American Skiing Company and lamented not being part of the Ski Utah Interconnect. Now it boasts the first lift connection. We did a little hike off the mid-way station of the new Quicksilver Gondola, jumping off the cornice on Pinecone Ridge and arcing through thigh-deep fluff on Limelite as we made our way back into Park City. A couple other gates offer nice tree shots all the way down to King Con. Overall, the expansion and connection between the two resorts is a huge boost to Park City, which used to be my least favorite ski area in the three-resort Park City area, behind the Canyons and Deer Valley. Now the two biggest mountains are linked, and it’s very easy to make your way back and forth. After a quick 12,000 vert of seriously soft turns we decided we couldn’t justify playing hooky for a second day (field trip to Sundance justifying one day), so we skied down to the Park City base, grabbed a bus back to the Doubletree, then headed off into a snowstorm to Salt Lake. With the weekend’s massive snow machine continuing to churn across the West, we opted for the more-traveled route home via I-15 and then highways 6 and 191 back to I-70. By the time we reached New Castle in Colorado the skies were hammering hard again and we received the welcome news of a rare snow day for the Eagle County School District. 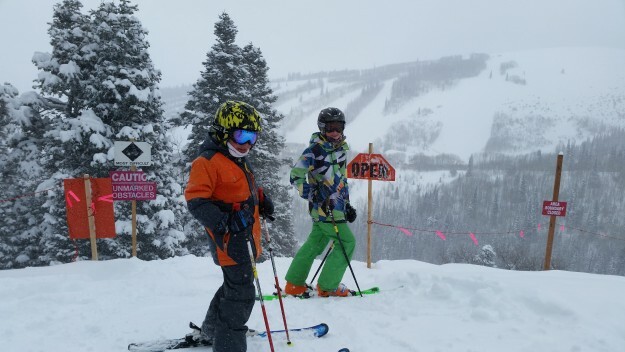 So on Tuesday we awoke to another full foot of fresh at Vail, and the boys and I took full advantage, following the storm from Utah to Colorado and maximizing our blower-snow quotient. Doesn’t get much better than that … unless maybe the Broncos win on Sunday.